AmeriServe “The Reliable Plumber” been doing residential plumbing in Hunterdon county and Warren County, Nj since 1995. We are a certified professional plumbing contractor that provides 24/7 service with a professional and very well trained staff of plumbers. We believe that our record of service to our customers is the best, and we want you to be one of our valued customers. We have a highly trained staff of plumbers who can handle any plumbing problem, and if the problem persists after our work, we will do it again at no extra charge. We are also knowledgeable about the latest high-tech and very efficient plumbing fixtures that will add to the enjoyment of your home. 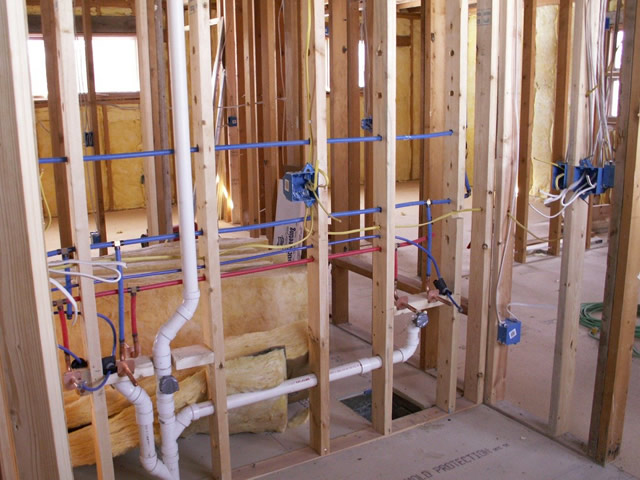 The plumbing supply industry has developed many plumbing features that are based on the principles of ecology. Their designs are sleek looking and very eye-catching. If you are thinking about a bathroom remodeling consider the wonderful and relaxing multiple shower heads that will stream water all over your body. These shower heads can have a muscle rejuvenation effect as well. There are multiple choices of shower heads to choose from. Toilet design has taken on a futuristic form with designs that are compact and lines that are pleasant to look at. We have multiple sinks to select from, and one of the most popular is the pedestal sink. The glass bowl sinks are very nice looking and they add a touch of modern class to your bathroom. If your home is older, there is a high probability that the sewer lines are beginning to close up with debris, tree roots and cracked pipes. Older sewer lines do deteriorate. Tree roots can travel a long distance to get into a sewer line. Sewer pipe is laid in segments of 20′ and roots are able to penetrate at those locations where one segment joins another. The older pipe that was made from clay or asbestos are very brittle and they take in water. Tree roots seek these pipes out and penetrate them. Some tree roots grow larger than the sewer pipe so they can destroy sewer pipe easily. The ground may have settled when your house was built and this will crack the pipe causing a major problem. There are other reasons why pipes crack and sag. A broken sewer pipe can affect your neighbor’s health, contaminate soil, and seep into underground water aquifers. The most distressing result is the backup of sewage into your home. We can conduct an easy inspection with a TV camera of your sewer line all the way to the city main. You can see what is lurking in the line. With so many wonderful new plumbing features we urge you to consider upgrading your bathroom. We believe this will give your home a sense of modern beauty, and it will give you an uplifted spirit. Treat yourself to a luxurious bathroom. Call us today at(610) 365-2337 for a free consultation. We want to make you one of our many loyal and appreciative customers.